En dan vond ik het vandaag wel weer eens tijd voor een custom Dunny! Ditmaal heeft Haus Of Boz een Chuckboy Dunny zodanig bewerkt dat dit schattig beestje er uit kwam! "As an intrepid adventurer, and author of many explorer's journals, Pippin Lugnut knew no fear. All the better for him, as he was accidentally chewed in half by a giant mechanical whale during a stunt show, on a boating holiday in the Iron Isles. Typical, these things always happen when you're on vacation. The extremely contrite whale was dreadfully embarassed by the whole affair, and personally paid for Pippin to be rebuilt by an engineering expert, holidaying at the same beach resort. It was a messy business, but they don't call the Iron Isles the Land of Invention for nothing. A few pistons later, and Pippin was back on his newly functioning cyborg feet. He has always been a "glass-half-full" kinda guy, and accepted his new body and accompanying skills with excitement. These days you'll still find him adventuring, but he's also pretty handy at finding things with his x-ray vision, and if you're stuck getting the lid of a jar of delicious pickled beets." 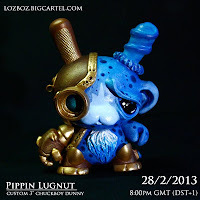 Pippin Lugnut is te koop in de store van Haus of Boz voor zo'n £69,99- (ongeveer €80,-).